What’s better than throwing a party to celebrate America? Good food and drinks, good friends, good music, all in the land of the free and home of the brave! Nowadays, it seems that people look for any possible excuse to throw a party- from birthdays to anniversaries to holidays that don’t even pertain to us or make sense, like St. Patty’s Day, National Pizza Party Day, and National Mole day. However, on a limited budget it can be hard to have the funds for all of these celebrations – that’s where we come in. We’re going to run through some tips on how to throw a party, without making a huge dent in your wallet. 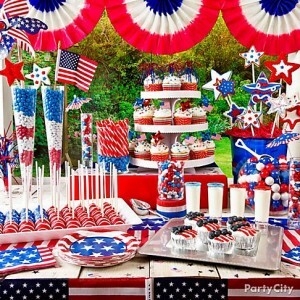 Since it’s summer time, we chose to talk about planning an inexpensive Independence Day party. You will probably want to have a backyard BBQ for your July 4th celebration – BBQ’s are traditionally the best type of summer holiday party! To make life easier, send out invitations through a social media website, like Facebook; this makes it simple to always be aware of how many people can and cannot attend, along with giving you a real time way of communicating with your invitees. It’s also completely free! We all love America, but don’t go overboard on the dessert table. Themed parties often call for a lot of supplies and decor. For your Independence Day party, I’d suggest going with the obvious red, white, and blue color scheme! Instead of spending your money on pricey pre-made decorations, cut red, white, and blue stars and stripes out of inexpensive construction paper. To keep the kiddies entertained (because 4th of July parties are usually a family occasion), provide a patriotic arts and crafts table with supplies from the $1 store or from Amazon.com, this can include face paint, bike decorating supplies, American flag making, and tie dying. Buying inexpensive cups, plates, napkins in bulk while you’re purchasing your decorations is also a really smart way to save money. Prepare the main meal and ask your friends to bring the sides, like potato salad, corn, and dessert (this is a great way to save money, plus friends love to help!). Round up some coupons and go to the sale section of your grocery store’s meat department for some ground beef, hot dogs, and chicken legs, don’t forget buns! The trick is to dress up inexpensive food to make it look fancier/more expensive. For example, toast the hotdog and hamburger buns, add colorful spices to melted butter for the corn, or even put cheese inside the burgers before cooking them (this is making me hungry). Provide some inexpensive snacks before the main food is served so people will be less hungry and eat less of the pricier stuff. For example, eggs are cheap and can be used to make deviled eggs and sour cream and soup mix can be used to make inexpensive chip dip. Love making pretty, festive desserts? Here’s a great recipe for patriotic cupcakes (cupcakes!) and another for patriotic popsicles (popsicles!)! The cost of drinks for a party can add up quickly. Buy store brand juice mix; put the mix into a pretty pitcher with fruit slices – nobody will even suspect that you’re trying to save money! If you want to provide some alcohol, buy an inexpensive brand of vodka and add some to a pitcher of the juice you made with the juice mix, and vuala! To get festive with your beverages, buy a box of store brand gelatin mix and whip up some patriotic jello shots! 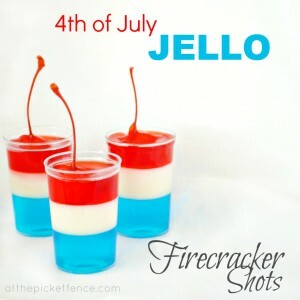 Here’s a simple recipe for them: Firecracker Shots! If your friends prefer beer, ask them to bring the beers they like (aka BYOB)! I know it’s easy and fun to go all out when planning parties, but if you cut down on what you buy and use some of these tips, I can assure you that most of your guests will not notice and will still have just as much fun. And don’t forget to save your leftover supplies for next year’s 4th of July festivities! 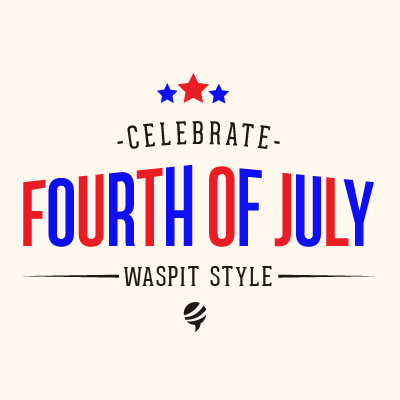 Enjoy and have a great Independence Day! Extra: some fun July 4th DIY. Also, if you’re eligible for a graduation party and haven’t hosted yet, this is a great opportunity for a split theme – check out some grad party guidelines here.